The Paris Climate Agreement aims to limit the human-induced global temperature rise to less than 2°C. Meeting that goal will require a global energy system with net zero emissions by 2050 or sooner. Renewable energy sources, such as wind and photovoltaics (PV), will help make a zero-emission energy system a reality. However, the variable nature of these energy sources limits their practical use for electricity generation. Integrating energy storage with energy production is the key to a zero-emission energy system future. Energy storage can be built into a concentrating solar power (CSP) system, without increasing the cost of the delivered energy. The standard industry approach of producing electricity with energy storage is to heat a molten mixture of potassium and sodium nitrate salts to high temperatures using the solar concentrators. The thermal energy can be stored or used on-demand in heat exchangers to produce steam to power steam turbines. The CSP industry is expanding, but is still a decade behind PV in deployed capacity. This article introduces the concept of leveraging the Haber-Bosch ammonia synthesis process as a potential lower-cost energy storage alternative to molten salts in CSP plants. Solar thermochemical energy storage (TCES) exploits a chemically reversible reaction by using solar energy to heat an endothermic reactor. The reaction products are stored, and when energy is needed, it can be recovered as heat given off by an exothermic reactor that reconstitutes the original reactants. In addition to ammonia, reactions involving hydroxides, carbonates, hydrides, and sulfates, as well as methane reforming, have been investigated as TCES media (see pp. 30–35) (1–3). Annual global production of ammonia is more than 160 million m.t., making ammonia the second-most-common chemical commodity produced (after ethylene). The Haber-Bosch process for ammonia synthesis has been used industrially for over 100 years, and at scale in most industrialized countries. The U.S., for example, has more than 50 ammonia plants (4). An industrial ammonia plant, as a whole, is a major energy-consuming system. Typically, plants use natural gas as a feedstock and as fuel to drive the operation. Much of the plant is dedicated to the energy-intensive process of steam reforming of natural gas to produce hydrogen and nitrogen gas mixtures. (For more details on the ammonia production process, read the Sept. 2016 CEP Back to Basics article “Introduction to Ammonia Production,” pp. 69–75). 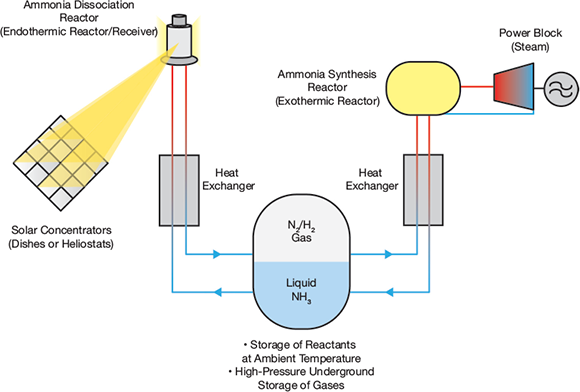 The Haber-Bosch ammonia synthesis reactors are exothermic. The reaction heat is usually captured as superheated steam that is used for cogeneration of electricity or other plant processes. This approach could, instead, be employed to operate a standalone CSP plant. The feedstock of hydrogen and nitrogen could be produced by the decomposition of ammonia, driven by solar energy from a concentrating solar thermal (CST) system, with the reactants continuously recycled. Ammonia has been shown to be a viable solar TCES medium over three decades of research at Australian National Univ. (ANU). Researchers at ANU demonstrated 24-hr operation of a complete system, with a dish concentrator, endothermic and exothermic reactors, and a storage vessel (5 ). The Univ. of California, Los Angeles (UCLA), has continued this work (6, 7). UCLA researchers are investigating cost-effective gas containment technologies, the use of ammonia synthesis to enable production of 650°C steam for a supercritical steam Rankine cycle, and integration of the endothermic reactor within a CSP tower receiver (8). In an ammonia TCES process (Figure 1), ammonia is dissociated endothermically (NH3 + 66.8 kJ/mol ↔ 1/2 N2 + 3/2 H2) as it absorbs solar energy during the daytime. When energy is required, the reverse reaction releases energy to heat a working fluid, such as steam, to produce electricity. ▲Figure 1. In an ammonia thermochemical storage system, high-temperature solar concentrators decompose ammonia. The products of the decomposition, hydrogen and nitrogen, are stored underground at ambient temperature. When energy is needed, the gases are fed to the ammonia synthesis reactors, which give off heat that is used to create high-pressure steam for power generation. A key feature of the process is the recuperative heat exchangers paired with the endothermic and exothermic reactors, which lower the endothermic reaction products’ temperature to near ambient and then raise their temperature prior to the synthesis reaction. As a result, transport and storage of the reactants and products is conducted at ambient temperature. The simple reaction has no side reactions, so there is no need for elaborate control systems or nonstoichiometric mixtures to maintain complete reaction reversibility. The constituents are inexpensive and remain stable at the proposed operating temperatures. The large differences between the densities of ammonia (liquid at the operating pressure) and nitrogen and hydrogen gases enable their storage in the same tank with natural phase separation. Because of the natural phase separation in the storage tank, the availability of the feedstocks for the two reactors is independent of the degree of completion in the other reactor. The vast industrial experience in ammonia synthesis can be tapped. Conventional ammonia synthesis reactions are run at high pressures (up to 300 bar). Because high pressure favors the synthesis reaction, the reaction can be conducted at higher temperatures, which increases reaction rates. To adapt the conventional method to a closed-loop ammonia TCES system, high pressure is applied to both the endothermic reactors and the reactant storage volume to avoid a large loss of work during gas compression. Designing the entire system for high-pressure operation is a major engineering challenge of developing the technology.